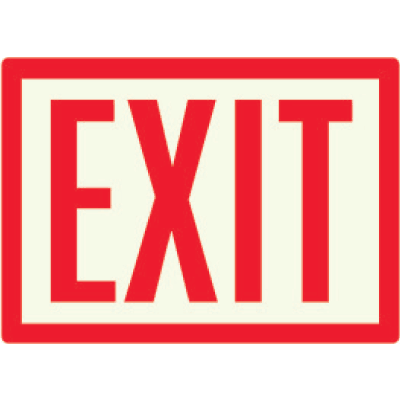 In the event of a sudden power outage, glow in the dark exit signs show your employees how to safety exit the building. There are many reasons why the power could go out, some of which include potentially hazardous situations. Posting a glow in the dark exit sign is an effective way to maintain compliance with OSHA standards. At Seton, we offer many different glow in the dark exit signage to suit all your needs, including Braille Glow-In-The-Dark Exit Signs. These ADA compliant signs are made from a Glo Brite® material that illuminates instantly when the lights go out and stay bright for over six hours. According to OSHA regulations, all exit and non-exit doors should be clearly marked so that employees can find their way outside in the event of an evacuation. Stay compliant by posting glow in the dark exit signs from Seton. A glow in the dark exit sign starts to shine the minute the power goes out, ensuring your workers are never in the dark about how to make their way towards safety. At Seton, we offer everything you need to stay compliant, including Not An Exit Glow-In-The-Dark Sign. Post these signs on doors along exit routes that do not lead towards safety, for example, you can use them on utility room doors, storage closets, and more. These glow in the dark signs are made from SetonGlo Luminous Polished Plastic, which means they glow for up to 6 hours in the dark or smoky conditions. We also offer Luminous Exit and Path Marker Signs that are maintenance-free and do not require electricity to glow. 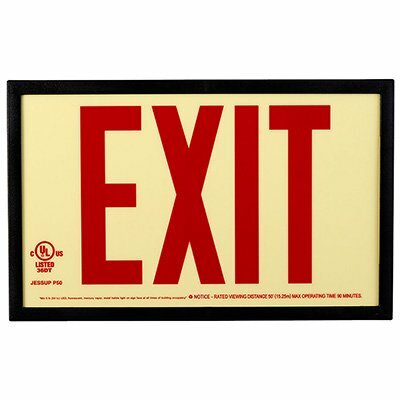 This glow in the dark exit signage is made from a flexible 4-mil self-adhesive vinyl, rigid 60-mil plastic and heavy duty 40-mil aluminum. These signs exceed the ASTM E-2072-00 and E-2073-00 requirements.